This faith manifesto succeeds at focusing on the idea of how divinity works, and it wonders at the human soul. 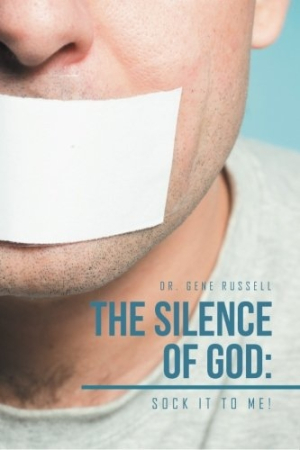 In his personal manifesto, The Silence of God, pastor Gene Russell makes a passionate case for a personal and loving God despite a seemingly indifferent universe. The Silence of God reads like a punchy self-help book. It repeats rhetorical questions concerning God’s silence in the face of suffering, with seventeen chapters attempting to answer the questions from a Christian viewpoint. Stories of human pain, reiterations of historical evils, and numerous quotes from writers and philosophers all build toward a personal testimony of God’s presence in the author’s life. Peppy phrases like “Sock it to me!” become important refrains that reinforce the book’s central concept of divine intervention. This protracted testimony is well written in terms of grammar and syntax, but topically, it wanders. Some personal stories ramble, cataloging painful episodes experienced by the author’s acquaintances, though these brief summations don’t have the depth or detail to be powerful. Narrative points of view randomly switch with little warning or context. These stream-of-consciousness techniques impede the work. The book’s creeping orthodoxy limits its audience appeal and undermines its message of a personal, loving God. Homosexuality and gay culture are lumped in with long enumerations of sins, and at least one passage quietly and unnecessarily delegitimizes Islamic faith, as well as other non-Christian religions. These supremacist tendencies erode messages of love, divinity, and redemption. When the book clearly articulates its message, it reads beautifully, and there are gems to be found. “God’s silence does not mean indifference,” Russell writes. “His silence is the silence of higher thoughts.” Such passages exemplify the keen intellect and spirit at work in much of the book. Russell follows these higher thoughts to the personal recognition of his own fallibility and his need to grasp for something greater than himself, beyond what can be seen and known empirically. The book includes enough material from major writers like C. S. Lewis and Viktor Frankl to be intellectually stimulating to non-Christians. It also incorporates opposition ideas from agnostic and atheistic thinkers as a counterbalance, as well as historical arguments for the existence of God. Particularly interesting is Saint Anselm’s ontological argument for a deity, which the book neatly summarizes and explains. With similar proofs of God threaded together, a teleological metaphysic emerges. Humanity’s desire and need for a higher being springs from the very design of the universe, the book argues. The book succeeds when it focuses less on doctrinal issues and more on how the idea of divinity works wonders in the human soul. The Silence of God offers an eloquent testimony of Christian faith, and nonbelievers may find some of the book’s broader insights interesting and relevant.